Garden Club of Norfolk Awards and Grants – The Garden Club of Norfolk, Inc. 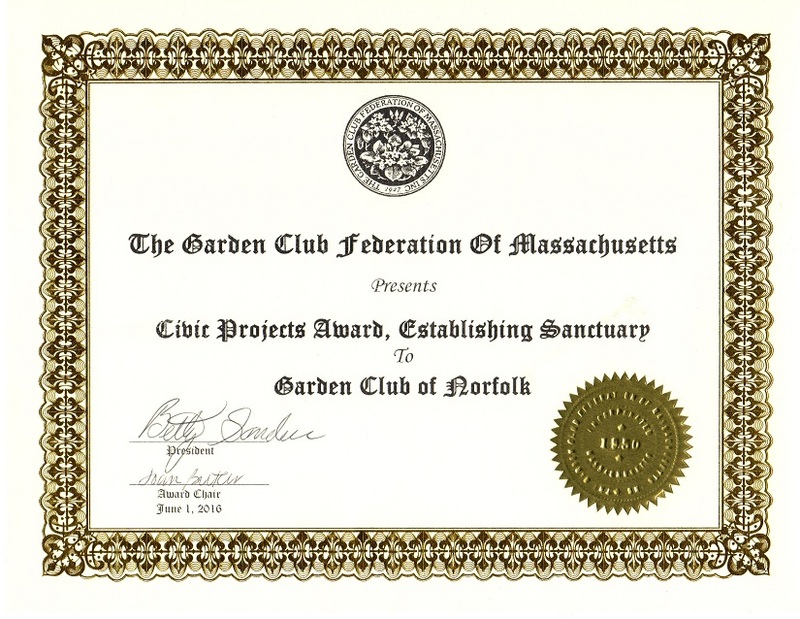 Awarded by the National Garden Clubs, Inc. 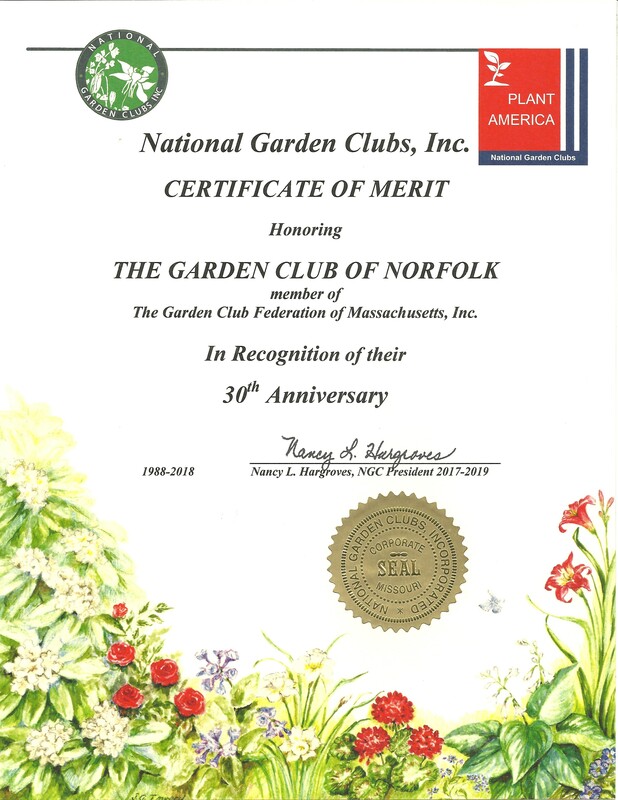 Certificate of Merit, in Recognition of the Garden Club of Norfolk’s 30th Anniversary (1988-2018). June 6, 2018. 30th Anniversary Certificate of Merit. The Garden Club of Norfolk received a Certificate of Merit Honoring it as a member of the Garden Club Federation of Massachusetts in recognition of their 30th Anniversary. Receiving the honor from GCFM President Suzanne McCance are NGC President Ann Prior, and Past Presidents Sharon Pierce and Helena Drolette. 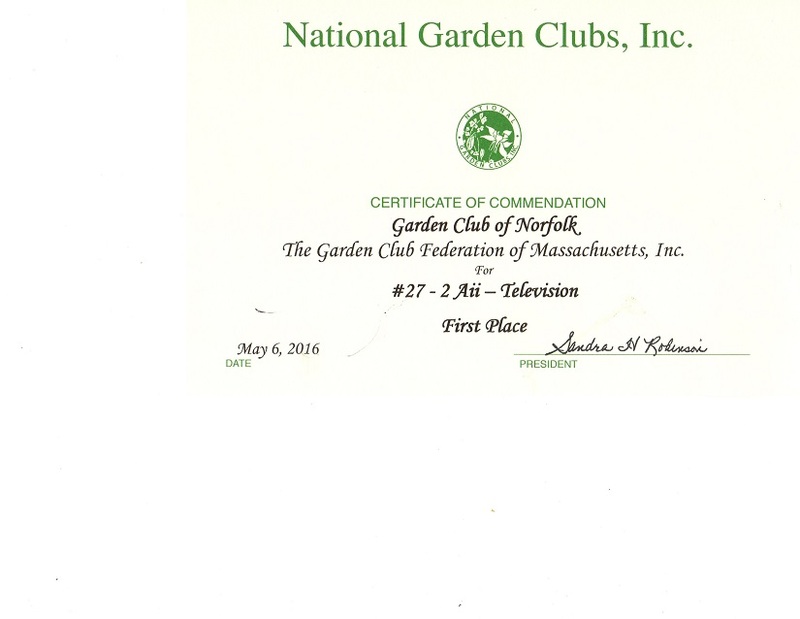 First Place Television (Medium sized Club), Public Service Announcement, June 1, 2016, First Place Television Award Certificate. Development Award. Tramp House Landscaping, First Place, c. 1988. Best Miniature Tall Bearded Iris, Williamson-White Medal, August 2015, Stephanie Markham, “Hot News” MTB iris. 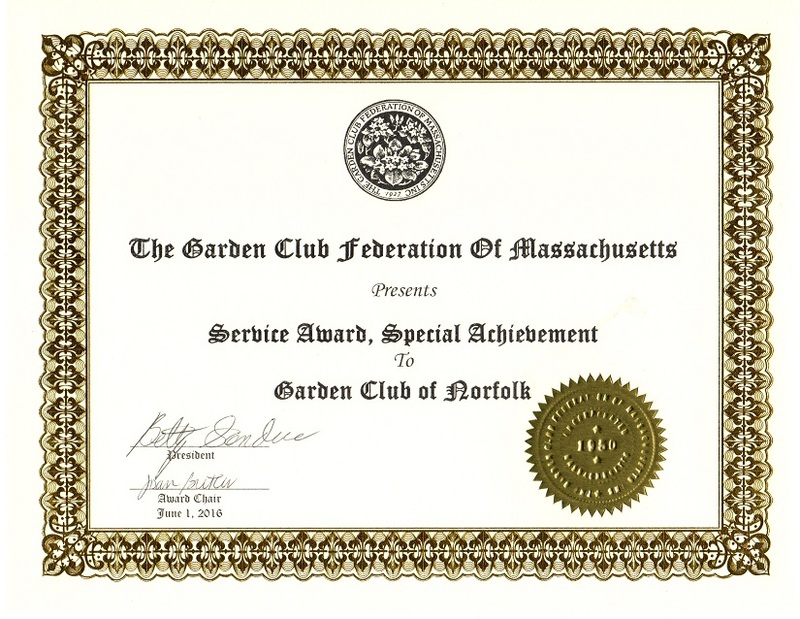 Awarded by New England Region of State Garden Clubs, Inc. 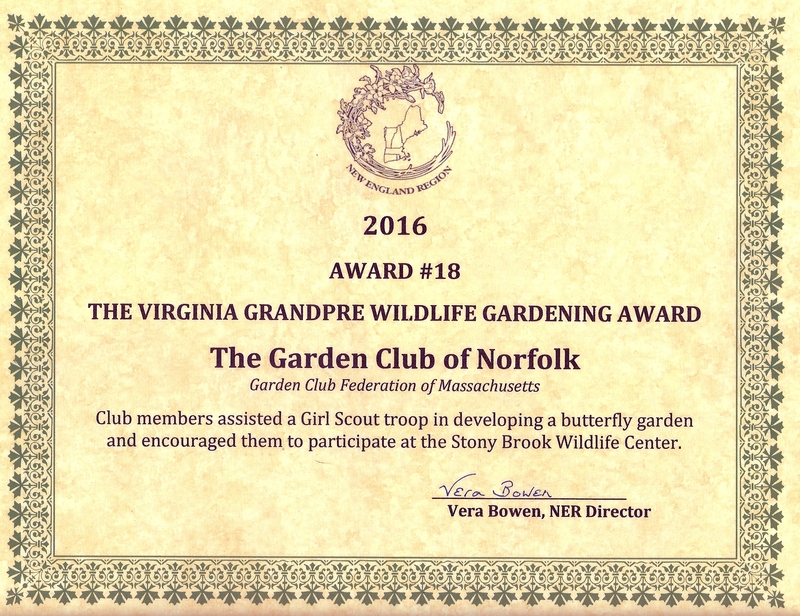 The Virginia Grandpre Wildlife Gardening Award, Girl Scout Monarch Way Station, October 18, 2016. 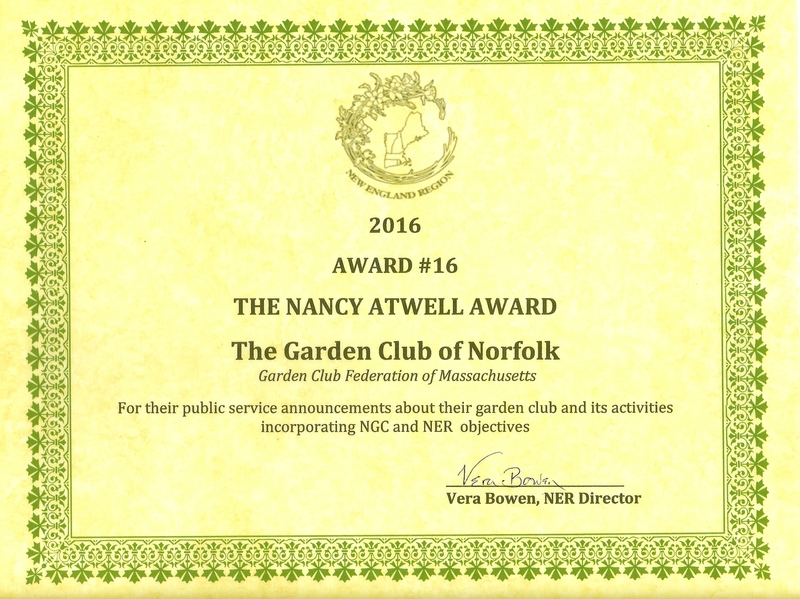 The Nancy Atwell Award, Public Service Announcement, October 18, 2016. 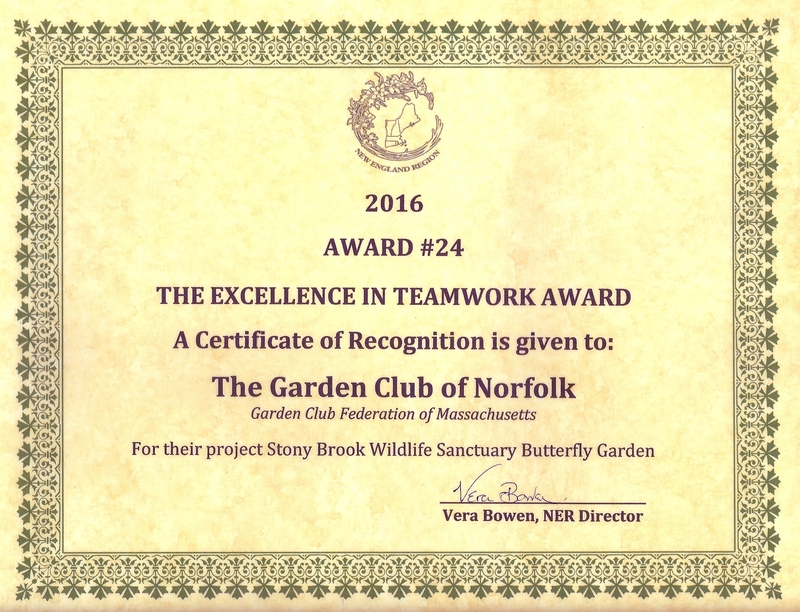 Historic Preservation Grant, Memorial Rose Garden Project, October 25, 2017. Save an Heirloom Plant, First prize for a small garden club, June 7, 2017 – $50.00 gift certificate to Weston Nursery. 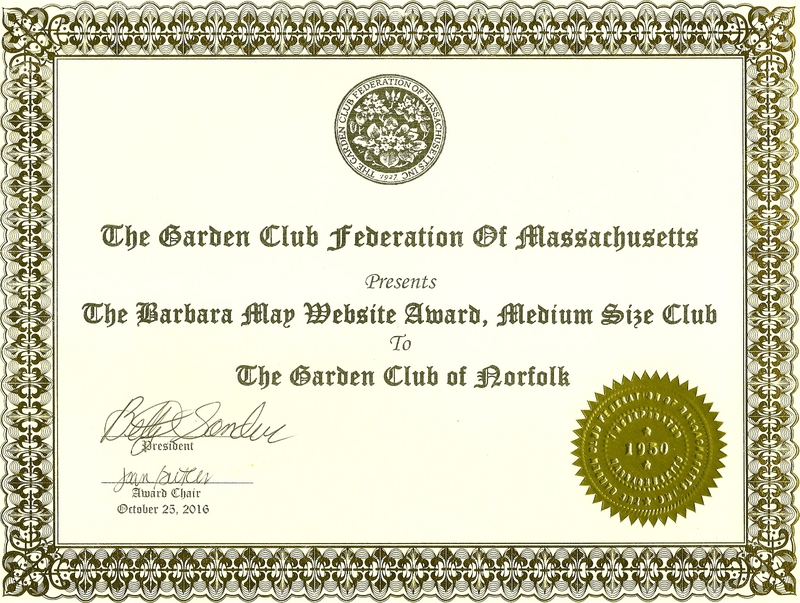 The Barbara May Website Award, October 23, 2016 and October 18, 2016. Margaret R. Bell Newsletter Award, June 3, 2015 and June 7, 2017. Liz Davey (2015) and Emily Nicodemus (2017), Editors.